1. Expand and contract storage space easily in a pooled environment. 2. 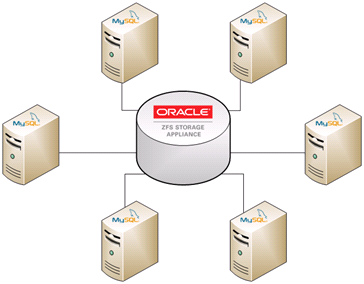 Focus high-end caching on the Oracle ZFS Storage Appliance to simplify provisioning. 3. Eliminate network overhead by leveraging Infiniband and Fibre Channel connectivity. This blog post will focus specifically on NFS. A followup post will discuss iSCSI and Fibre Channel. Each database should be contained in its own project. 1. From the ZFS controller's CLI, create a project called 'mysql'. Note: If a name service such as LDAP or NIS is not being used, change these to the actual UID and GID found in /etc/passwd and /etc/group on the host. The option file my.cnf should be modified to offload the database onto the Oracle ZFS Storage Appliance and to make additional tunings for optimal performance. Prior to changing this file, MySQL should be stopped and restarted once completed. A double write buffer is necessary in the event of partial page writes. However, the transactional nature of ZFS guarantees that partial writes will never occur. This can be safely disabled. Ensures that InnoDB calls directio() instead of fcntl() for the data files. This allows the data to be accessed without OS level buffering and read-ahead. The data filesystem for InnoDB should be located on its own share or LUN on the Oracle ZFS Storage Appliance. The log filesystem for InnoDB should be located on its own share or LUN on the Oracle ZFS Storage Appliance. This configures a single large tablespace for InnoDB. The ZFS controller is then responsible for managing the growth of new data. This eliminates the complexity needed for controlling multiple tablespaces. You can also download the following example my.cnf file to get started. The Analytics feature of the Oracle ZFS Storage Appliance offers an unprecedented level of observability into your database workload. This can assist in identifying performance bottlenecks based on the utilization of your network, hardware, and storage protocols. Its drill-down functionality can also narrow the focus of a MySQL instance into a workload’s operation type (read/write), I/O pattern (sequential / random), response latency, and I/O size for both the data and log files. At any point in time, a DBA can track a database instance at an incredibly granular level. Once you have a single database installed, you can try creating more instances to analyze your I/O patterns. Run separate sysbench processes for each database and then use Analytics to monitor the differences between workloads.